EXEMPT YOUR AFFLUENT CLIENTS FROM THE LAW OF LARGE NUMBERS. In the classic life insurance paradigm, your special-risk clients were typecast by standard actuarial tables even when their sophisticated clinical care should have favorably differentiated them from the norm. Now you can break free of that model, facilitated by a game-changing strategy called Risk Differentiation UnderwritingTM (RDU). We work directly with you, your client and your client’s physicians to separate their individual risk from an otherwise statistical/actuarial group. This strategy allows you to achieve favorable life insurance coverage levels and premiums that others simply cannot. In the process, you distinguish yourself as a provider of intensely personal service that can enhance long-term client relationships. RDU REDUCES PREMIUMS BY 34% ON AVERAGE. EVEN YOUR MOST DISCERNING CLIENTS WILL BE IMPRESSED WITH THE RESULTS. THE TIME TO START IS IMMEDIATELY. Rather than risk underwriting disappointment, reach out to our RDU experts at the beginning of your dialogue. We proactively consult with your client and their corps of physicians to assess the medical history and understand the client’s unique circumstances. WE CRAFT A DISCRIMINATING, FACT-BASED CASE. We prompt your client’s medical team to participate actively as patient advocates during the underwriting process. This allows our experts construct a detail-rich profile that captures the unique clinical merits of the case, allowing Home Office Underwriters and Medical Directors to fully differentiate the individual risk. WE LEVERAGE OUR RELATIONSHIPS WITH PREMIER CARRIERS. BSMG will not “shop” your client’s case around the industry. With more than 25 years of experience in Risk Differentiation Underwriting, we know how each carrier assesses specific impairments and where we can negotiate the most favorable premium while reducing time-to-approval. DOING THE GOOD AND RIGHT THING IS LIFE-CHANGING FOR YOUR CLIENTS. You can trust our professionals to listen, research and engage on multiple levels with your clients and their physicians. As we gain the confidence of your clients, we are also proud to enhance their trust and respect for you. The primary goal of Risk Differentiation Underwriting is to “always do the good and right thing” and to recognize that “the client always comes first.” Advisors bring our team of experts to the table to talk with their clients about the most personal and intimate details of their lives —their health and their mortality. We do not accept what is immediately apparent as final—rather, we dig deeper and go beyond the APS—for you and your client. HOW WE DETERMINE IF RDU IS APPROPRIATE FOR YOUR CLIENT. 1. Understand the medical challenges. At the earliest point, we triage and analyze the unique characteristics of your client’s medical history to determine if the case can benefit. 2. Engage the client and their corps of physicians. We explain the gaps between insurance medicine and clinical medicine with all stakeholders to achieve client buy-in and gain access to the extensive information this strategy requires. Up front, we discuss what premium costs will be acceptable to the client and advisor. 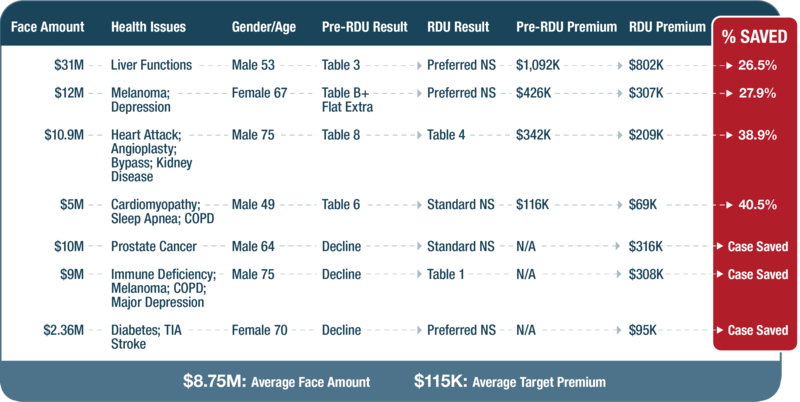 The minimum annual premium to initiate RDU is typically $25,000. We will explain the sequence of events so the client understands how they can favorably impact the underwriting result and the eventual premium.